Adorable set of beautiful flower note cards from Christian Lacroix. With these cards in the shape of a butterfly or a flower bouquet, it is an absolute little present in your friend's mailbox! 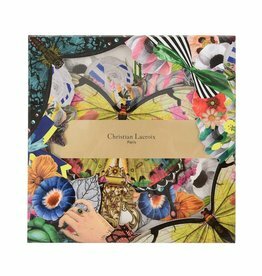 This beautiful Haute Couture Boxed Note Cards Set from Christian Lacroix is an absolute fabulous must have. With lovely printed designs, fashion sketches and embossed sealing stickers, perfect cards for a very stylish thank you! Say thank you in style with these elegant correspondence cards from Christian Lacroix. These 12 correspondence cards are made of gold foil with an ivory reverse with beautiful matching envelopes!